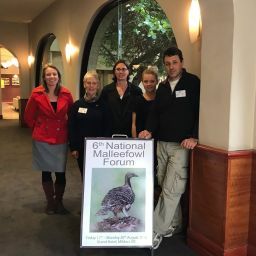 It has been another big month at NACC NRM which you can read about in this month’s NACC Notes – thanks to articles by team members – so I will focus on what is coming up at NACC NRM during October. Some of you will have seen already, but for those that haven’t, October is awards month for NRM in the NAR thanks to the 2018 Regional NRM Leadership Awards. Most of you will be aware that it has been a tough six months for NRM in the NAR. For those of you who are not already aware, our 2017-18 Annual Report – which will be on our website in the coming weeks – will elaborate on this in more detail. Despite the significant changes at NACC, we wanted to ensure continuity in our acknowledgement of all the wonderful work which is done by #PeopleOfNRM across our great region. 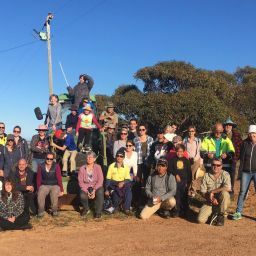 The third Regional NRM Leadership Awards are our way of saying thank you to the amazing people and groups who help us deliver our mission to Catalyse Community Conservation. This year, the awards presentation ceremony will include a free sundowner event held on 29 October 2018 starting at 3.15pm immediately after the NACC NRM Annual General Meeting in Lotteries House, Geraldton – where the NACC office is now located. Tickets are available via Eventbrite and will be required to gain entry to the awards – click here for tickets. 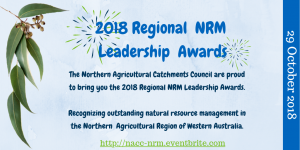 The Regional NRM Leadership awards are an opportunity for everyone to say thanks to those people and groups in our community, who more often than not, work tirelessly and thanklessly for the environment and natural resource management. We can only recognise these amazing people with your help and submissions. We know finding the time to write submissions can be hard. We have tried this year to make things as easy as possible for anyone making a submission, but if you have any problems at all lodging your submission, please don’t hesitate to contact the NACC office and our team will help you. We are very excited to have Geraldton Community Bank Bendigo Bank Branch on board as a sponsor for the third year running, this year for the first time, as our Gold Sponsor. We could not be putting on the awards without this support and the support from our other sponsors including Carbon Neutral. Further sponsorship opportunities are still available; please contact me Katherine Allen if your organisation would also like to support the awards.